We don’t run our transfers to a schedule; we tailor them to your flight times. That means less waiting and no missing your scheduled minibus. If your flight is delayed, we’ll put you on the next available transfer from Geneva Airport and we’ll NEVER cancel your transfer at the last minute. Plus, we’ll always drop you off and pick you up from as close to your door as we can get, so you don’t have to wait in the cold or trudge through the snow with your bags. Your safety is our number one priority, which is why we make sure all our drivers have plenty of experience and are properly qualified to drive with passengers. Our drivers are also fully trained to drive in the snow and have plenty of knowledge about the local area. If you want to know the best places to eat, the closest ski lift to your accommodation or you just want a good chat, your driver will be happy to oblige. And help you carry your bags. Arriving in Geneva Airport at the weekend can be a daunting experience, which is why we have Getaway Vans representatives stationed in the arrivals hall every Saturday and Sunday throughout the winter. No more looking through the crowds for a sign with your name on it; just head left as you come out of the arrivals doors and make your way to our desk by the big green Tekoe tea shop. One of our friendly reps will advise you from there. 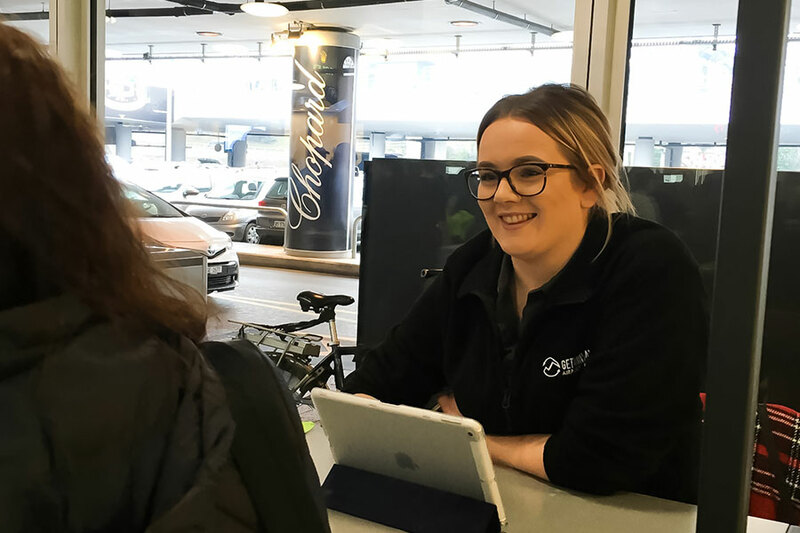 If you have any last-minute questions about your airport transfer or your scheduled pick-up time is out of office hours, there will always be a member of staff on call to help you out in case of emergency. Just call +33 (0) 64 03 22 184. We use eight-seater (nine including a driver) Renault Traffics, the crème de la crème of airport transfer vehicles, with a long wheel base that leaves plenty of room for suitcases and ski bags. We lease twenty-five minibuses (or Getaway Vans as we like to call them!) for the winter, which arrive in tip-top condition and are expertly maintained by our fleet manager, Steve, until they go back in April. 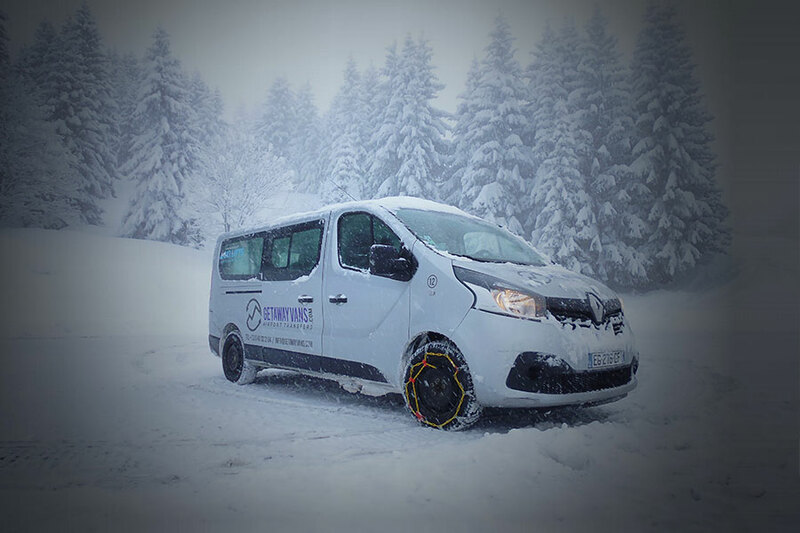 All our vans are less than two years old and are equipped with quality snow tyres, as well as top-of-the-range snow chains. We run airport transfers from Geneva to Morzine, Avoriaz, Les Gets and St. Jean d’Aulps (including La Grande Terche, Le Biot and Seytroux). And we don’t just have to pick you up from Geneva Airport; we can take you to and from Thonon, Cluses and Geneva central train stations, as well as Geneva city-centre hotels on a private basis. Call our office or send us an email if you’d like to know about prices for alternative destinations. Our prices don’t include any hidden charges; what you see is what you get. This price also includes free ski or bike carriage and as many baby or child seats as you need (available on request). We are an independent ski transfer company, NOT a booking agent, so you’ll always be liaising directly with us, never a middle man.